Legal cannabis has provided no shortage of new opportunities in Canada, including opening more doors for farmers in the hemp industry, especially in the province of Alberta. Since cannabidiol (CBD) can now be extracted in larger quantities for recreational purposes, Alberta farmers have been provided with new opportunities to partner with various licensed producers who can use their crops. 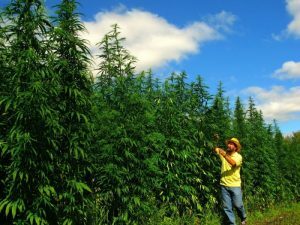 Hemp farmers are now able to sell the unused, raw material to the LPs who can use the material to extract CBD. Brian Rozmahel, a 59-year-old hemp farmer, told sources that he used to be teased about his crops but now considers himself a “pioneer” leading the way in an emerging industry in Alberta, thanks to legalization. “The first field of hemp that I grew, because it does look like marijuana, there was sort of a rebellious streak to me that went, ‘Wow, look what I’m doing!”, said Rozmahel. “People still stop on the highway and take a selfie.” Rozmahel is now able to sell his product to producers like Aurora Cannabis. The emerging hemp industry in Alberta has prompted NorQuest College in Edmonton to create an online course for hemp farming after various stakeholders said that this was an “industry of interest”. The college made the announcement Monday and said the program will include everything from growing to the impacts of climate to how to harvest and handle the product. Central Alberta happens to be situated in an ideal growing environment thanks to its lengthy, sunny days and the rich, black topsoil in the area. Legalization and the hemp industry have been incredibly important for the Leduc-Nisku Industrial Park which was hit hard by the oil recession in 2014. Area that was once used primarily for the oil and gas industry is being grabbed by cannabis companies who are repurposing the land for production facilities. Of those companies, Aurora Cannabis has led the way with their 800,000-square-foot facility near the Edmonton International Airport. Another cannabis-related venture in the area is reportedly pending but the company has not been made public. It’s said the new venture will create at least 300 jobs. The Leduc County has approved four new development permits for cannabis-related businesses in the last year alone. One of these permits is for HempCo, a Vancouver-based company, who will be building a 56,000-square-foot production facility. It will be the largest of its kind in the country. They have another facility in Manitoba. Jang says that the hemp industry is expected to be worth $2.2 billion annually within five years and it appears that Alberta is one region that will be leading the way.